Have you ever wanted to just kick yourself? Hindsight is 20/20, right? This specific hindsight makes me cringe. 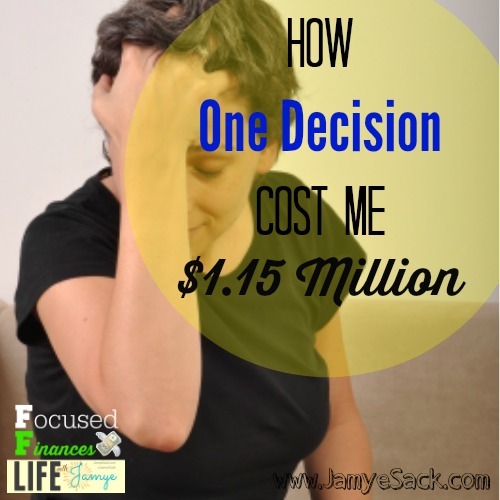 This one decision I made cost me $1.15 million dollars. Basically, I gave up being a millionaire for … well, let me tell you the story. That settlement handed me more than $5,000. I was given a choice that day. That money stayed in a bank account for a couple of years to ensure that it wouldn’t be needed for medical costs. I didn’t need it. Here come the choices. All I remember about that was as a 19 year old girl, I was running out of money. My parents knew the money was mine and tried to convince me to save it. I didn’t. I spent it, $20 at a time. Pretty soon, it was gone. All of it. Because of my $20 decisions (all “necessary” of course), I gave up being a millionaire. How? You ask. Simple math. Had I taken that $5,000 and made ONE decision to invest it. At a rate of 12% from that time until I would retire (65 years), it comes out to $1.15 million dollars. Without adding ONE SINGLE PENNY to that $5,000, Robert and I would be a millionaire today. Not overnight but over invested interest. My parents knew how to save. They tried to advise me. But I just didn’t understand the value of investing. Had I been shown the $20 meal next to the $1.15 million in the bank account, maybe I would’ve made a different decision. I didn’t. It’s not impossible to start today. But first, if you are in debt, let’s get out! Starring at $184,400 in debt. I get it. It’s overwhelming and straight out depressing. Let’s stay Financially Focused today and not give in to the temptation to trade today’s momentary pleasure or “necessity” for what could be tomorrow. Let’s hold each other accountable to make some wise decisions. I think we’ll thank each other in the years to come! Don’t you? What choices are you handed today? They are a gift. I hope you choose more wisely than I did. That was a painful lesson, but definitely one that you can share. Hopefully, your loss will be someone else’s gain. Thanks for sharing. I’ve done something similar. I was also in an accident, broke my back, was cut a similar amount check. I paid off a few medical bills that I had, bought myself a tablet since I couldn’t carry my laptop around while I was healing, and the rest…I have no bloody idea. I know I didn’t work much the first semester back because I was still barely able to stay awake for more than a few hours at a time (from healing and medication). It is possible I used it to cover some living expenses….but I still lived in the dorms. I have no idea what I did with that money! The phrase young and dumb comes to mind to but yeah, mistakes come and go.